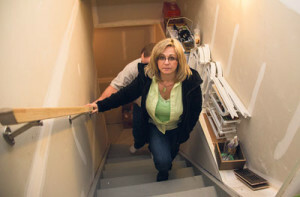 Shane Lacusta, along with his wife Pam, have a basement suite in their house in the S.E. community of Walden. They decided to build a secondary suite in case any of their three children need to move home one day. They took part in the City’s secondary suite grant program that subsidized the cost of building a secondary suite in their neighbourhood. They say that every house on their block has a secondary suite, but only their house and one other has a two-bedroom suite. Because the cost of the property was subsidized by the City, they are required to rent the suite at 90 per cent of the market price to a maximum of $1,102 before utilities. 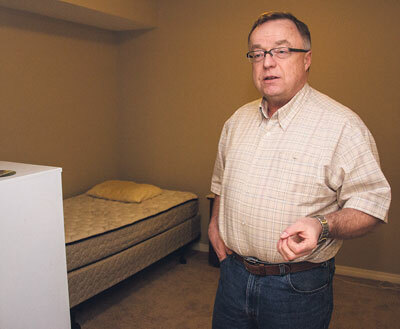 Shane Lacusta explains that the suite comes furnished with beds and basic -living furniture. Currently two Mormon missionaries live in the suite, but at the time of shooting, they had packed up most of their things and were out of town. 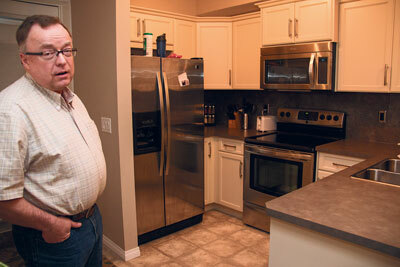 Shane Lacusta stands in the kitchen of the basement suite below his house. He put in brand new appliances so they wouldn’t have to worry about maintenance right away, and so that tenants (perhaps one day his children) would have a nice kitchen. The secondary suite has an outside entrance next to the kitchen, but the main house also has an entrance to the suite down a staircase that leads to a fire door that separates the house from the suite.